The GPS was telling us to turn left but all we could see on our left was the woods and a couple cows nearby. The castle might have been hiding behind the trees for all we knew, though it seemed a bit unlikely. Instead, we chose to go straight, towards the village of Beaumesnil. 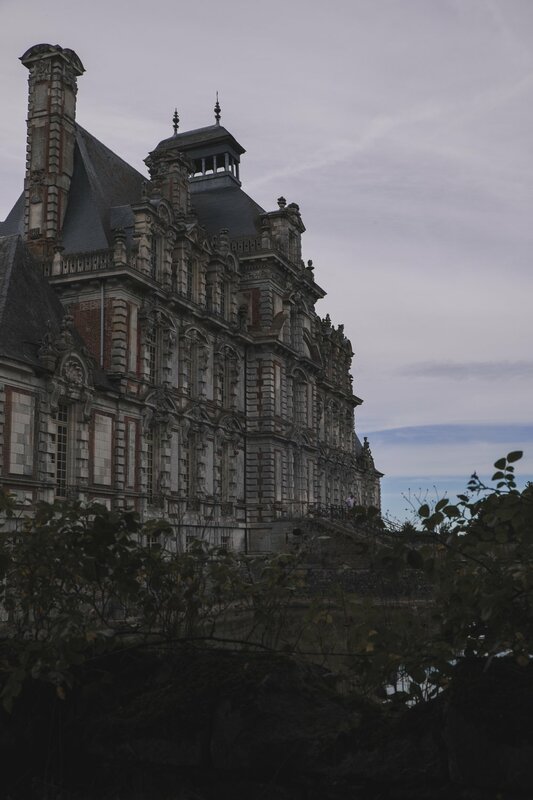 A baroque castle could hardly go unnoticed in a village of no more than 600 inhabitants anyway. A tall, wrought iron gate appeared behind a curve in the village, proving us right. We parked next to the gate and proceeded to the entrance, where our mere presence significantly lowered the average age of the visitors. Being under 25, we were even lucky enough to pay a discount price, as if the castle itself wanted to thank us for taking the time to visit it and entertain it with our youth. Maybe it even expected us to advertise it on Instagram too. Coming in, we had only noticed the upper part of the castle so when it appeared in its full grace, we paused in awe. It was a delight for the eyes, a compact fortress but with perfect proportions from one aisle to the other. Grey stones and red bricks were a match made in heaven, so was the roof covered in blue slates. Some sort of moat filled in water circled the building, separating it from the gardens like a stranded island. It sure was Instagram-worthy! We crossed the bridge upon the moat and got in. A monumental staircase welcomed us inside the property, which we climbed to get to the first room, an alluring salon showcasing vivid paintings and intricate wood panels from the 17th century. Next to it was the library, full from floor to ceiling with ancient books with leather-binding and coats of arms on their covers. All around us was graceful, refined, rendering the perfect illusion that we had jumped back in a time that was long gone, though its legacy had not vanished. 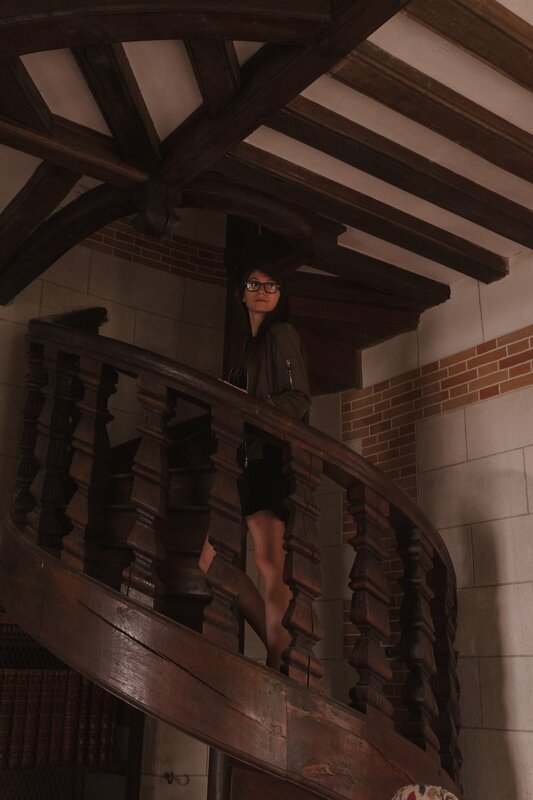 In a corner of the room, a wooden spiral staircase led us to the upper floor, straight into a corridor exhibiting ancient books, some of them dating back hundreds of years. As we kept walking, we got to the end of the corridor where a sign hanging on the door caught our attention. Right in front of us was a chamber of mysteries. 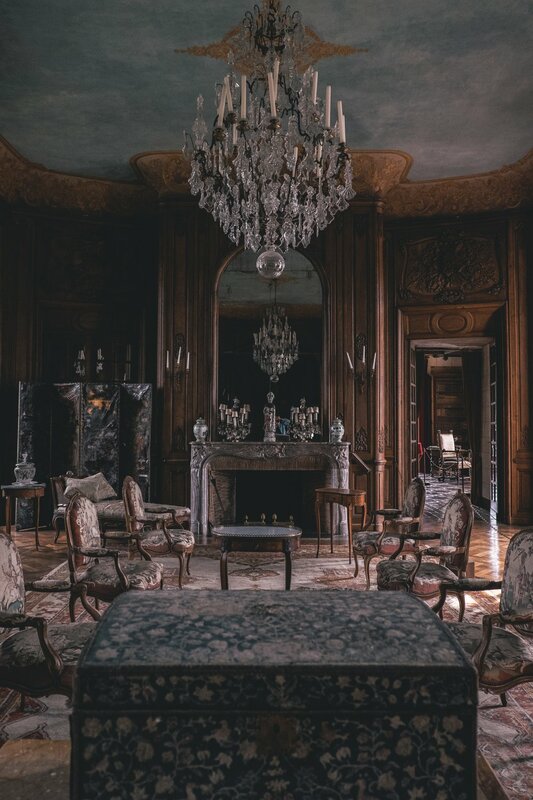 Eager to reveal all its secrets, we pushed the door open to discover a well thought-out escape game based on the work of one of the castle’s most famous guests, Coco Chanel, who had created her notorious perfume Chanel N°5 after her stay at Beaumesnil. We were caught up in our search for the four digits that would open the door and mean victory, gathering clues, deciphering mysterious notes on the walls. Counting the number of triangles sewn on a template? Checked. Putting transparent sketches on top of one another to reveal another number? Checked. Scratching our brain, we managed to get all digits right. Our victory was short-lived though. When we finally opened the door, twenty people or so stared right at us in irritation. How long had they been waiting out there? Judging by the look on their faces, it was probably too long for their own good. 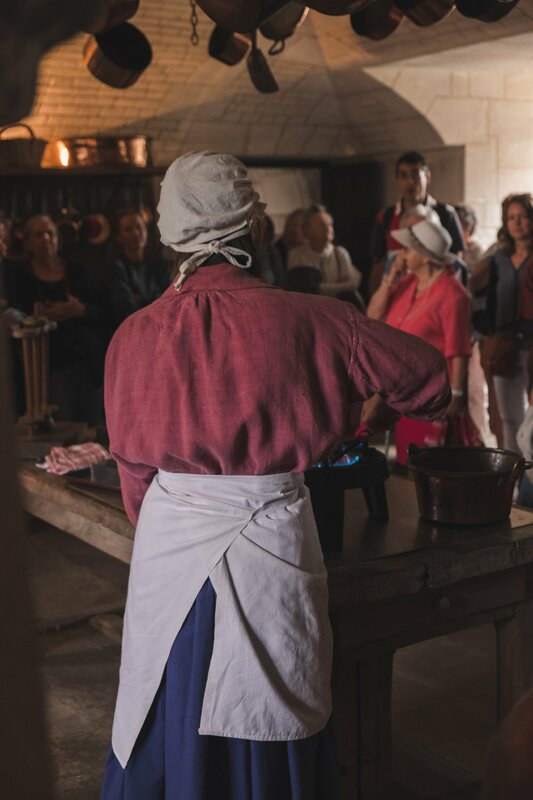 Escaping their scrutiny, we reached another aisle of the upper floor that was dedicated to the history of tableware. 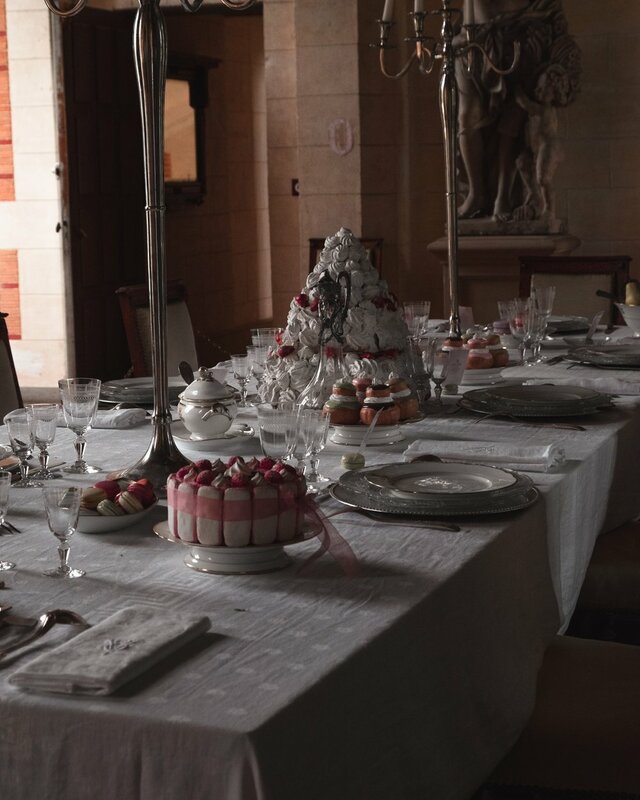 A recreation of traditional French tableware along with its English counterpart had been set in one of the rooms, while the main table of the former reception hall was buried in various desserts, from pyramids of macaroons to strawberry tarts. All of it was fake but we recalled that a caramel cooking demonstration was to be in session in a matter of minutes. 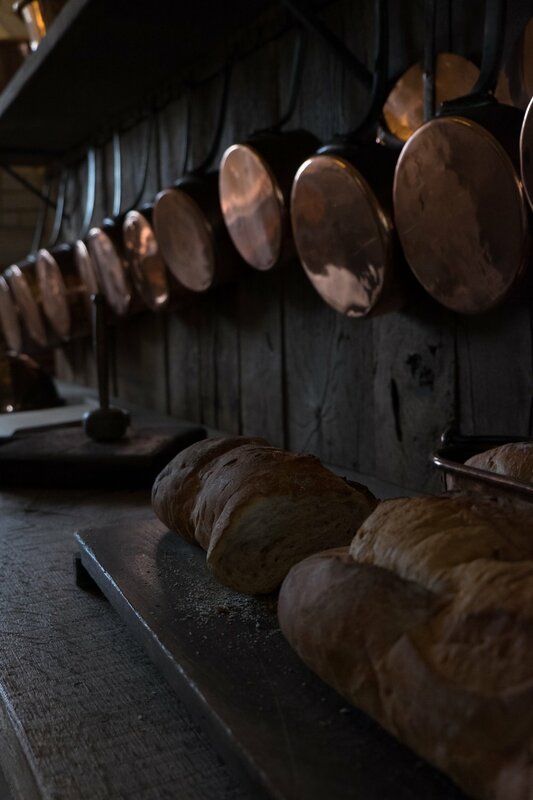 With our stomachs growling in anticipation, we headed for the kitchen downstairs. Rooms on both sides of the staircase were empty when we arrived and we decided to wait in the one that seemed most appropriate for a caramel cooking display. Of course, we were wrong. Of course, the room next door was packed when we got in. We found a nice spot behind the girl in charge of the demonstration nonetheless, who started blending sugar and cream while giving explanations about the room and showing ancient cooking utensils. Some of the visitors seemed genuinely interested while others were all too focused on the sweet smell to listen to anything she was saying. Most of the latter were elders, wiggling impatiently until the caramel was ready. When the time finally came, they swooped on the kitchen table like vultures upon their prey. The caramel was not even cut out yet but it didn’t matter. It would probably stick to their denture but it didn’t matter. It seemed like a matter of honour, like a battle to be won, and one of deference towards the elderly. All those reasons were probably why they had rushed to the caramel even faster than the children around. Once the caramel rush was over, we managed to grab one to share and left the room to spend some time wandering in the gardens. 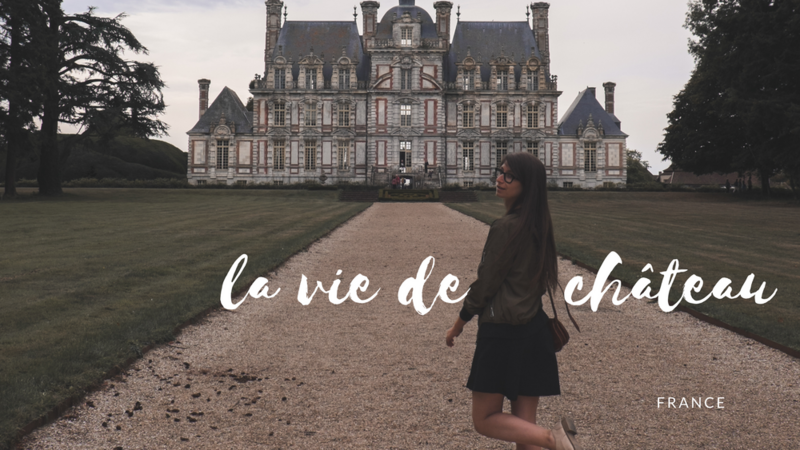 80 hectares was a bit too much for a simple stroll so we got back to the French gardens in front of the castle. A weird, overinflated bush that sat next to the entrance intrigued us. Called the feudal mound, it appeared to be a system of caves covered by a huge bush. On the other side of the building, a wooded alley was running near a river, leading to what looked like a farm. As we got closer to the mouth of the river, three dark animals appeared. They were a little too big for cats and a little too small for dogs. Our minds didn’t quite grasp what they were until they let out a grunt. Neither dogs nor cats, it was three tiny piggies, playfully chasing each other, monitored by their mother who was taking a sip in the river. 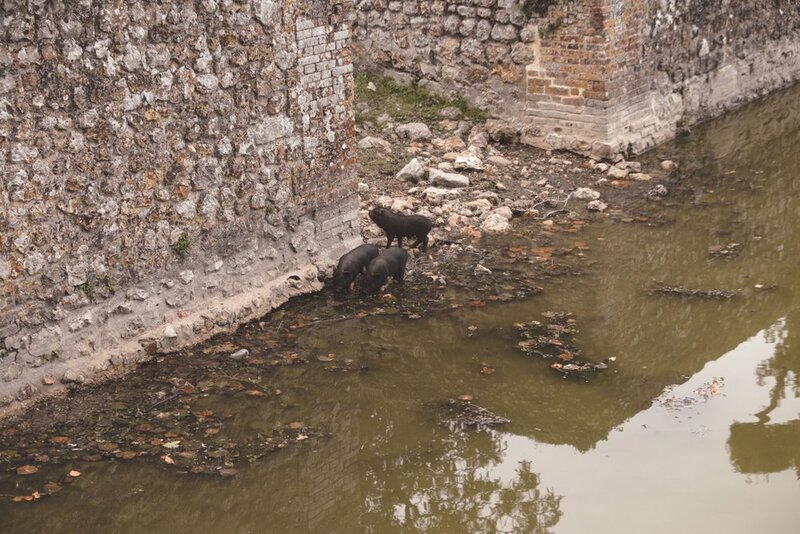 Seeing those pigs romping in the water could not have contrasted more with the elegance of the castle nearby, with its romantic portraits handing on the walls and neat gardens, but it painted a pastoral picture of opposites we quite liked. 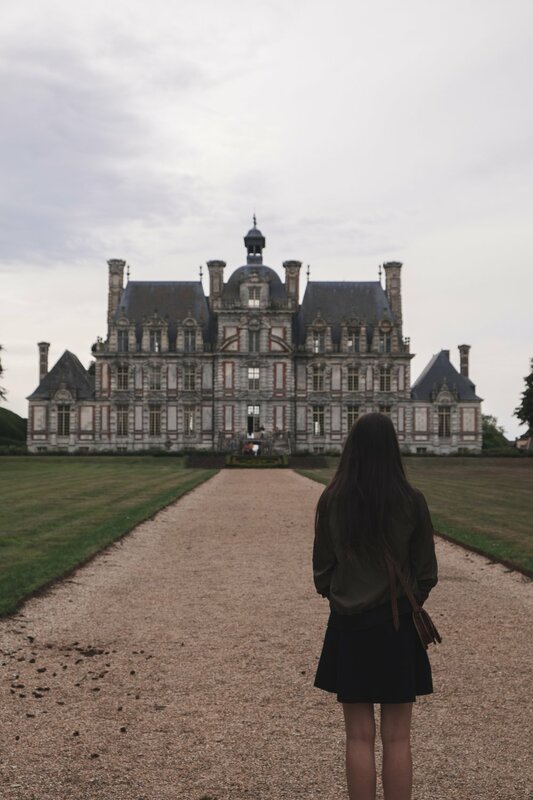 Beaumesnil was not just a castle but a place with a past and a present, expectant of what all generations could bring to its future.